1 pack of crimp beads for the edging. The bottom one didn't have enough edge to it, so I went with the design that used the metal beads. 1. 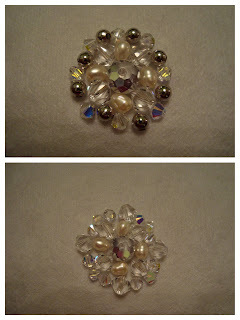 I cut the interfacing to a little larger than a 1" circle so there would be room to maneuver the beads. 2. 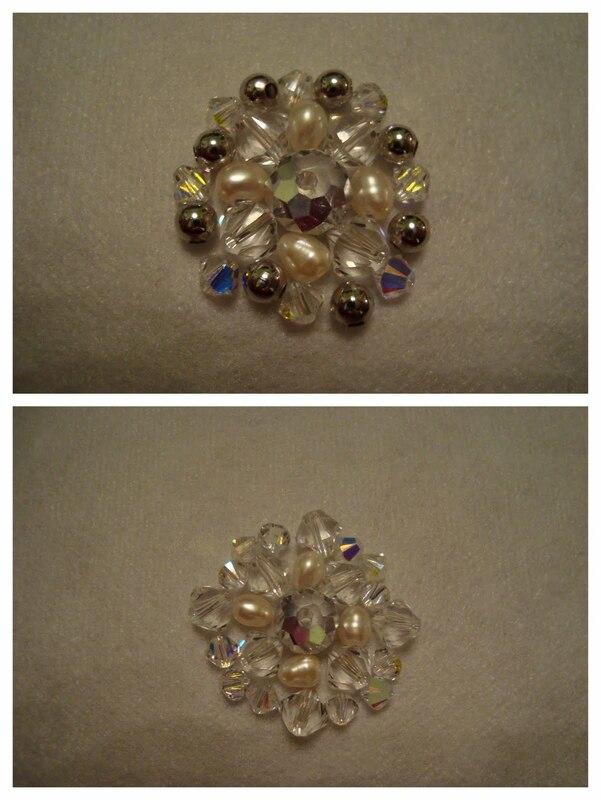 I then placed the first bead as close to the middle as eyeballing it would allow. On my second clip, I got a little smarter and drew intersecting lines so that I'd know where to place the beads radiating from around the middle bead. 3.So the hole in the middle of the center bead wouldn't show, I grabbed one of the crimping beads and pulled it through so it sits on top of the center bead, thus camoflauging the hole. 4. I started sewing my design into place. 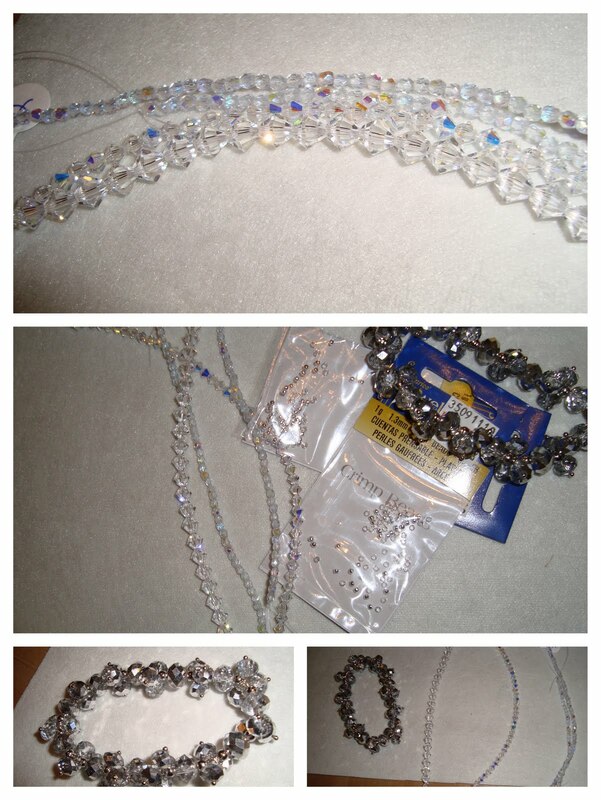 I started with the crystal beads, then the pearls, the Swarovski crystals, and then the metal beads. On every bead (with the exception of the pearls because the diameter of the hole was too small), I went through twice with the thread and knotted it in place on the back--I don't want anything falling off on the day of the wedding!! 4. Once I had my original design sewn into place, I realized something was missing. It didn't have that pop I was looking for. 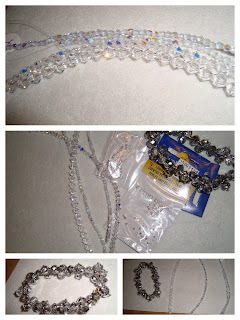 I ended up edging the whole thing with the silver crimping beads, and it was just what was needed. 5. After it was finished, I cut the excess interfacing off of the edge of the design, so little to none of it would show. When you do this, you have to be very careful not to cut through any of your stitches keeping the beads in place, or else it will undo all your good work. 6. Hot glue gun time! I put a dab of hot glue on the back (this has the bonus of cementing your stitches in place), and pressed the earring back into it. 7. Let it dry and voila! Shoe clips! I'm pretty sure that you could use any beads you wanted for something like this, you just have to keep the scaling in mind. 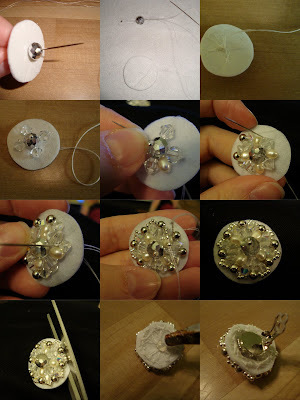 With my clips being relatively small, I made sure the beads I was using were varied in size, color, and texture to add visual interest, and I selected beads I knew wouldn't take up the diameter of the entire clip. Definitely try laying out your design prior to sewing, so you have at least an idea of where you're going and how to sew them on. That said, you'll never know how the beads will lay until they're secured down to the backing. Also (not that I would know this from personal experience), make sure that the needle you're using will go through the hole in the beads--trust me, it helps. You could do this on any budget, but because I used Swarovski crystal beads (and because I live in a small town where the only craft store in about 20 or so miles can charge whatever it likes for supplies), the clips cost me about $23, beads being almost 90% of that total. $1.50 for 1/8 yard of interfacing (I have nearly all of it left for future projects). If any of you decide to try it, leave me a comment or send me a picture--I'd love to see how they look!